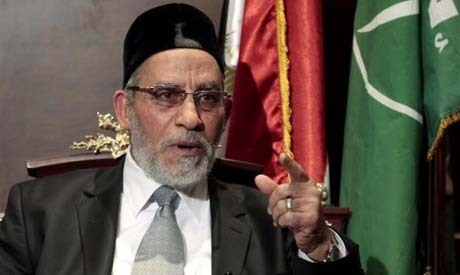 The Brotherhood's Supreme Guide Mohamed Badie announced on Thursday night that the group's candidate Mohamed Morsi will be running for Egypt's presidential runoffs. An emergency meeting took place between the brotherhood's bureau and the legislative office of the Freedom and Justice Party (FJP) following the recently announced constitutional court rulings which resulted in this decision. On Thursday afternoon, Egypt's High Constitutional Court declared Egypt's Political Disenfranchisement Law – which had threatened presidential finalist and Mubarak-era PM Ahmed Shafik with disqualification from the presidential race – to be unconstitutional. The contentious ruling will allow Shafiq to contest the presidency in a runoff vote against Morsi slated for Saturday and Sunday. A second ruling, meanwhile, found Egypt's Parliamentary Elections Law – which regulated last year's legislative polls – to be similarly unconstitutional. The latter verdict means that both the People's Assembly and the consultative Shura Council (the lower and upper houses of Egypt's parliament) will likely be dissolved and fresh elections held. The Brotherhood revealed in a statement published on their official web site, Ikhwan Online, that, based on a majority vote within the bureau, Mohamed Morsi is still running.